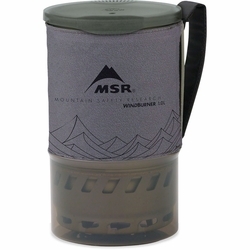 MSR WindBurner Pot. For backcountry or weekend trips involving more than 1-2 people, this accessory pot for the WindBurner personal stove system lets you share a fast-boiled cup of soup or coffee with friends and adds more versatility to minimalist camp cooking. The hard-anodized aluminum pot with built-in heat exchanger locks on to your WindBurner stove and efficiently transfers the stove’s radiant heat. The pot serves as a personal eat-and-drink mug and comes complete with a clear, BPA-free drinking and strainer lid, a pot cozy, extra bowl and a canister stand.